If your kids reach for a can of soda, have them peek at the ingredients—they’ll see artificial coloring, preservatives, and up to 50 grams of sugar! Instead, help them make this better-for-you-soda with just three ingredients—fruit juice, carbonated water, and a little sugar. And don’t forget to enjoy your drinks in style with our Silly 'Stache and Smile cutouts! 1. First, pull the rinsed grapes off the stems. Place them into a blender. 2. A grown-up can help blend the grapes until they turn into juice. 3. Set a strainer over a measuring cup. Pour the juice into the strainer. Press it through the strainer by stirring with a spoon. You should now have about 1 cup of grape juice. 4. Fill a small pitcher with the sparkling water. Add the grape juice and stir well. 5. Taste the grape fizz. What do you think? If it's too tart, stir in 3 to 6 tablespoons of Simple Syrup to the pitcher. Pour into glasses. 6. 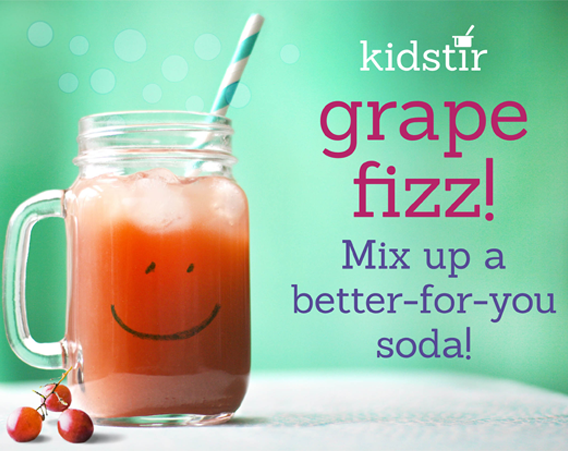 To make a sweetener for your grape fizz, a grown-up can heat 1 cup of sugar and 1 cup of water in a saucepan. Bring it to a boil and stir. When the sugar has dissolved, remove it from the heat and let it cool. Add 1 tablespoon of syrup at a time until your drink tastes perfect to you!